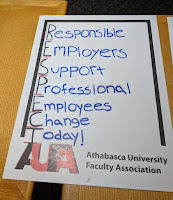 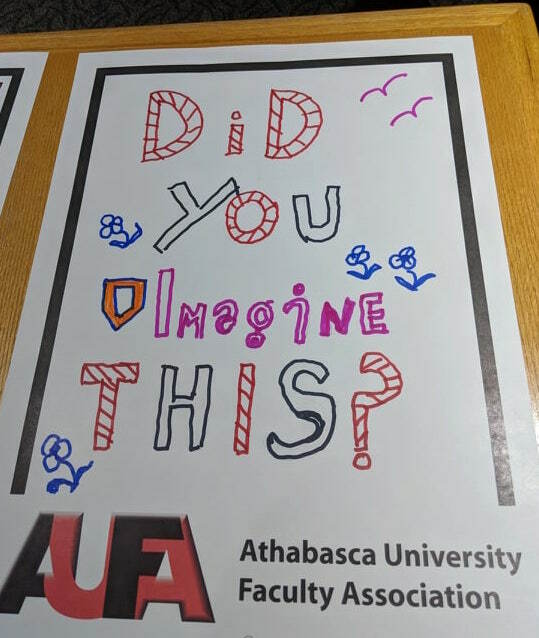 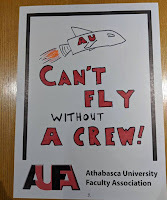 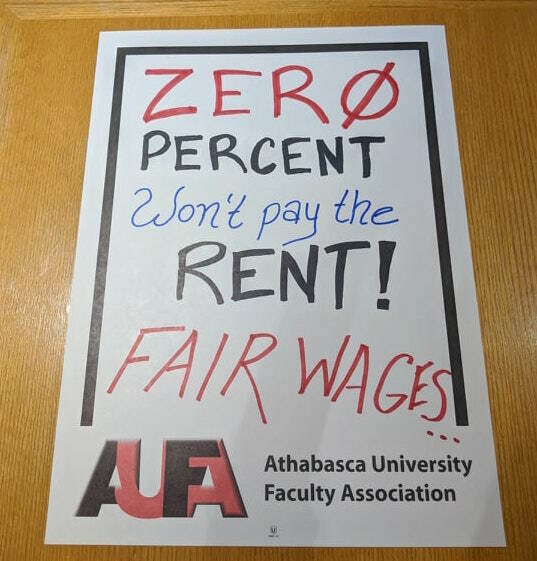 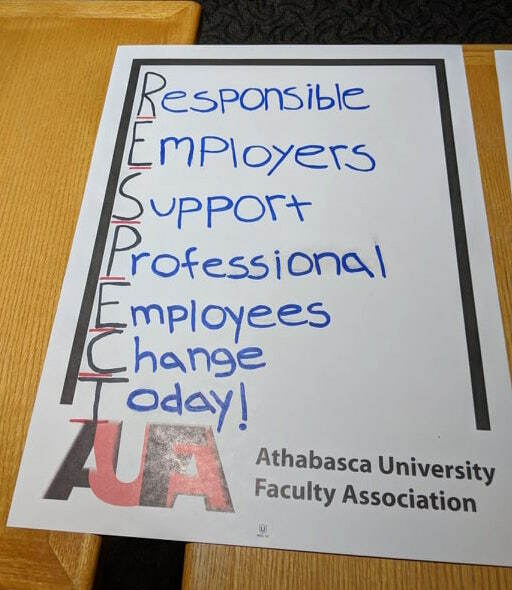 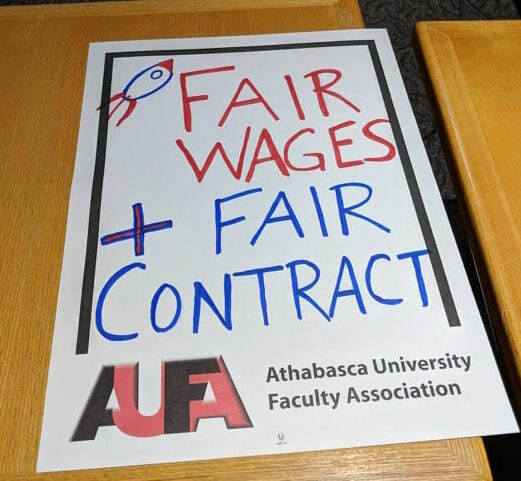 The Athabasca University Faculty Association (AUFA) spent another week preparing for what looks like an inevitable work stoppage. 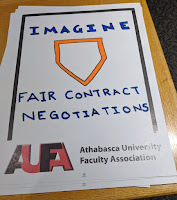 AUFA and AU met this week to both collectively bargain and negotiate an essential services agreement (which is a pre-requisite to formal mediation and an eventual strike vote). 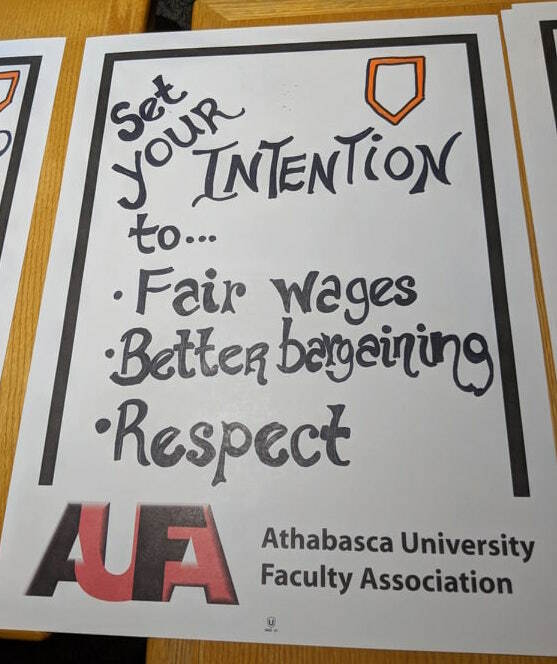 Collective bargaining saw AUFA agree to a small number of AU’s housekeeping items and the employer appears to have stopped pushing its odious company-doctor proposal. 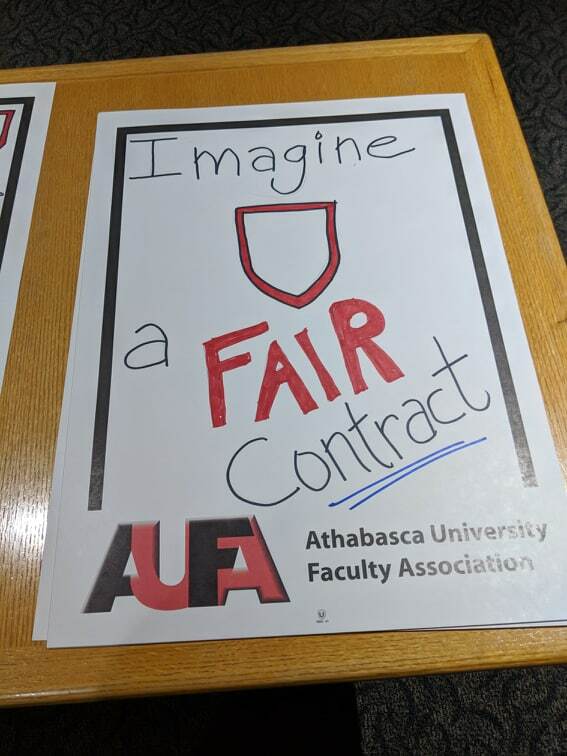 This shift represents a victory—likely brought about by (1) member pressure and (2) the untenable nature of the proposal. 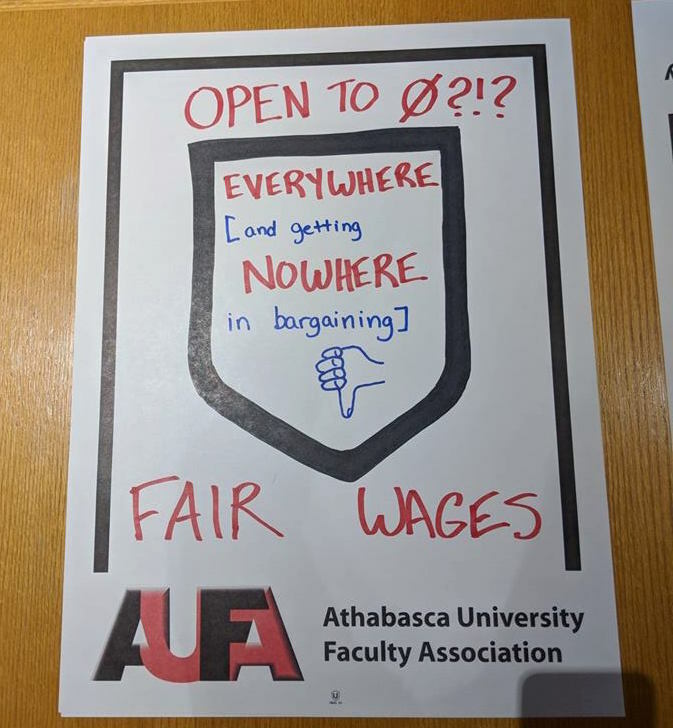 And it tells workers that resisting the employer’s demands is effective. 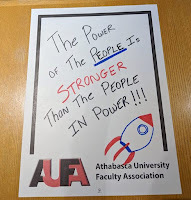 That said, the parties remain far apart and impasse is looming. 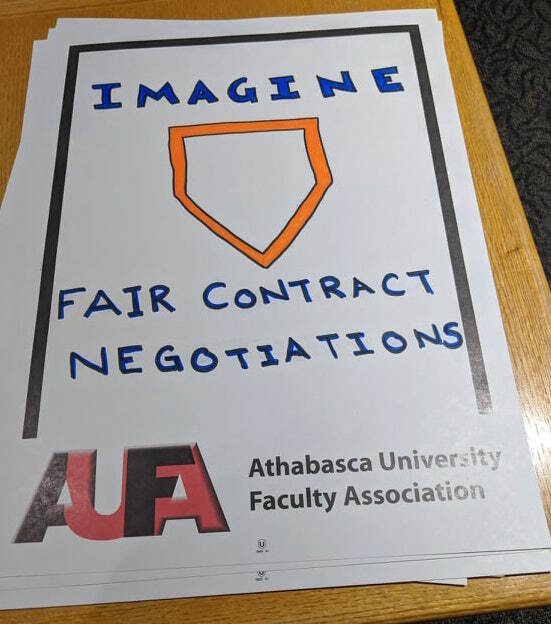 AU continues to push four other rollbacks that are deal breakers (affecting professional staff, appeals, discipline, and grievances). 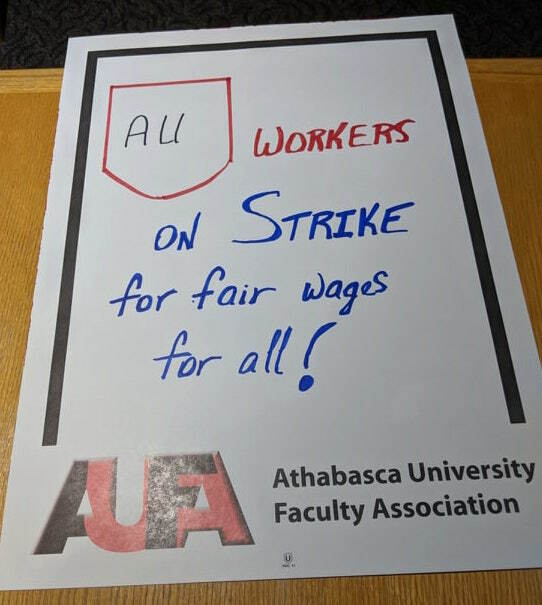 Further, AU continues to demand a wage freeze but refuses to agree to any AUFA proposals. 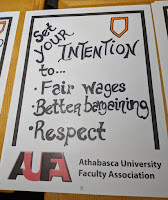 Accepting AUFA proposals will be necessary to gain AUFA’s agreement on a wage freeze (which is effectively an inflationary cut given that the cost of living went up 2% last year). 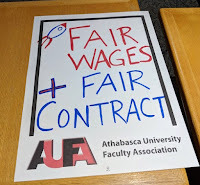 Bargaining continues today. 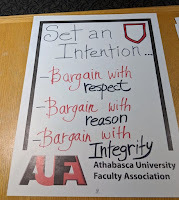 Given the trajectory of bargaining, AUFA hosted its second picket-sign luncheon last Friday (examples interspersed). 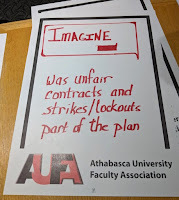 The most interesting development is the increasingly open mockery of the multiple strategic plans that the AU’s executive has produced over the past two years. 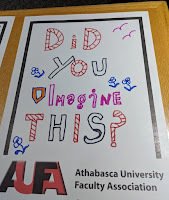 Specifically, we see the hijacking of the vacuous Imagine plan’s slogan as well mockery of the “rocketship” imagery associated with the strategic IT plan. 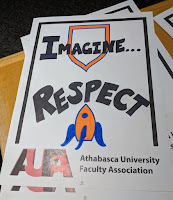 Open mockery is a sign that AU’s behaviour is both alienating its employees and radicalizing AUFA’s membership. 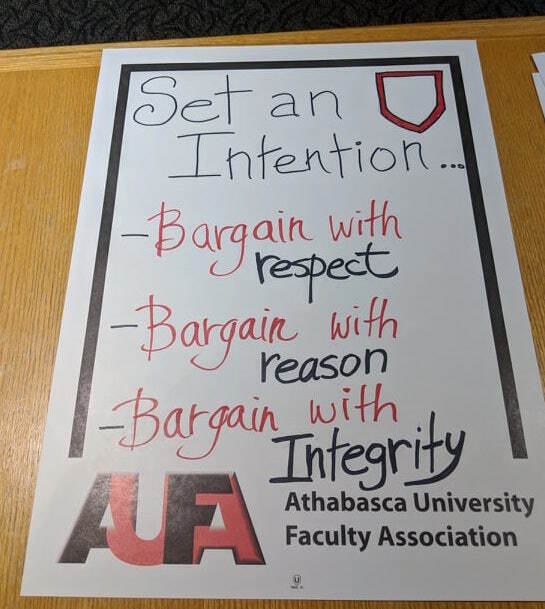 This strengthens the union’s hand and makes a strike mandate much easier to achieve. 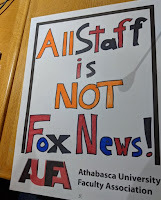 The president’s charm offensive earlier in the week (e.g., “working” in the cafeteria, chatting up staff on the main campus) clearly was not effective (pro tip: alienation tends to snowball quickly in labour disputes and you can’t grip-and-grin your way out of it). 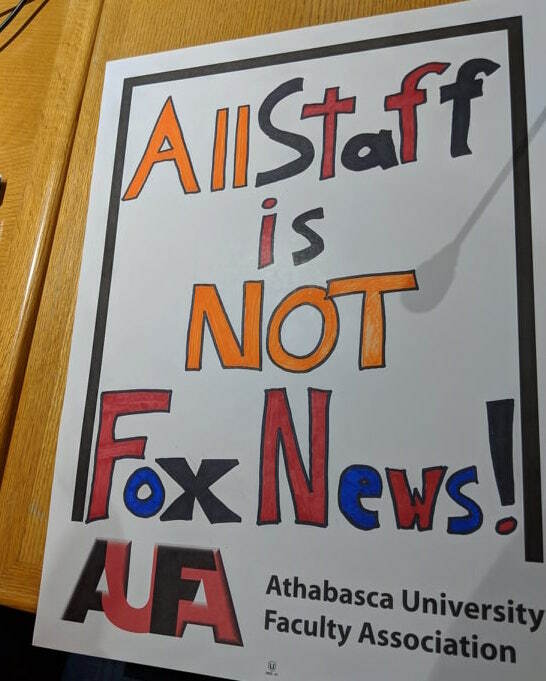 It will be interesting to hear how the suddenly scheduled “Conversations with the President” go, over the next few weeks. 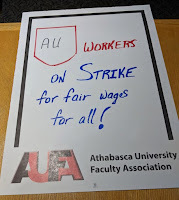 A further concern for AU is that the growing risk of a work stoppage is starting to come to the attention of students. 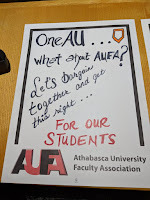 The best thing that has happened at AU in the past few years has been a huge surge in enrolments (up >12% this year), which has resulted in a projected surplus of at least $9 million. 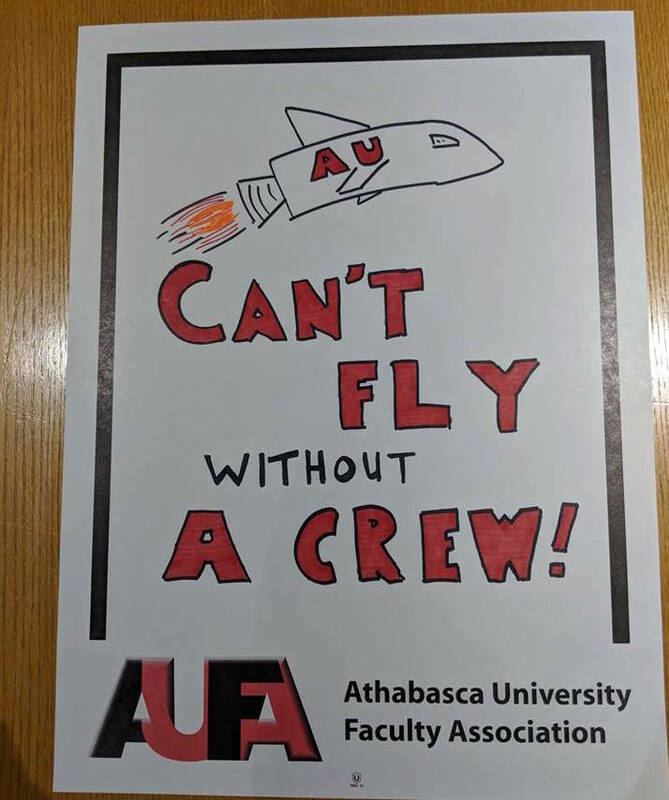 This growth is a big deal, because 50% of AU’s revenue is from tuition. 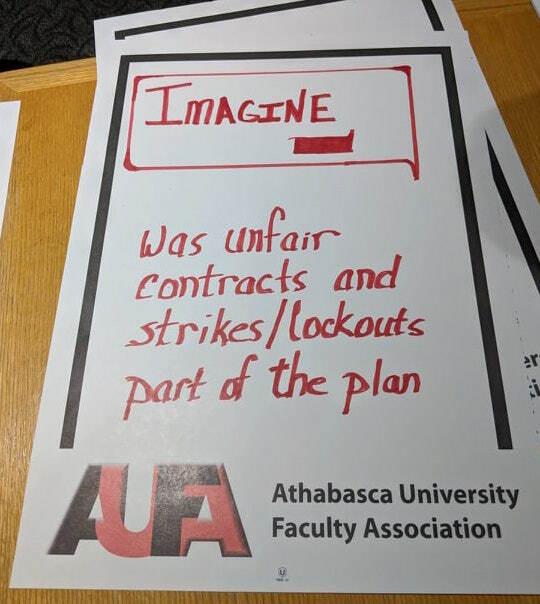 The longer AU prolongs bargaining, the more likely we are to see an effect on registrations. 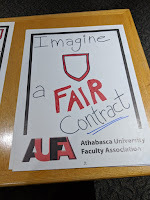 Who would enroll if a strike is looming? 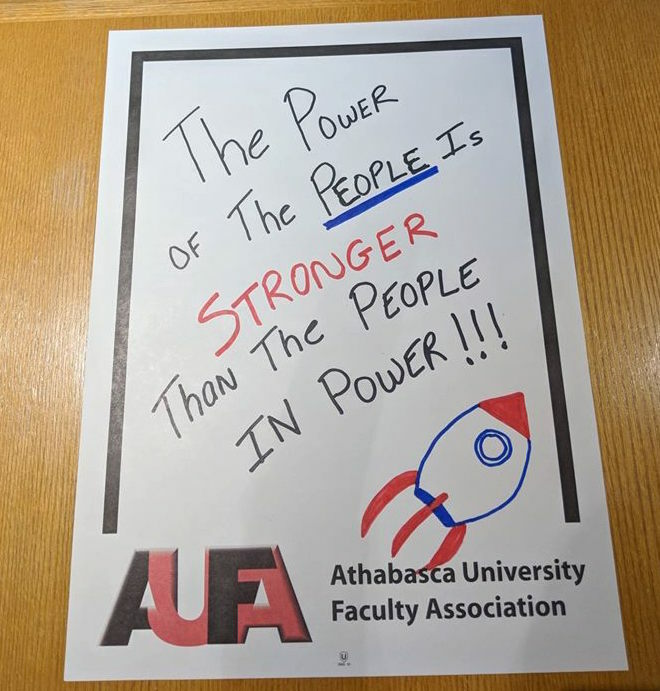 What this means is that the intransigence of AU’s executive at the bargaining table is imperiling AU’s financial security. 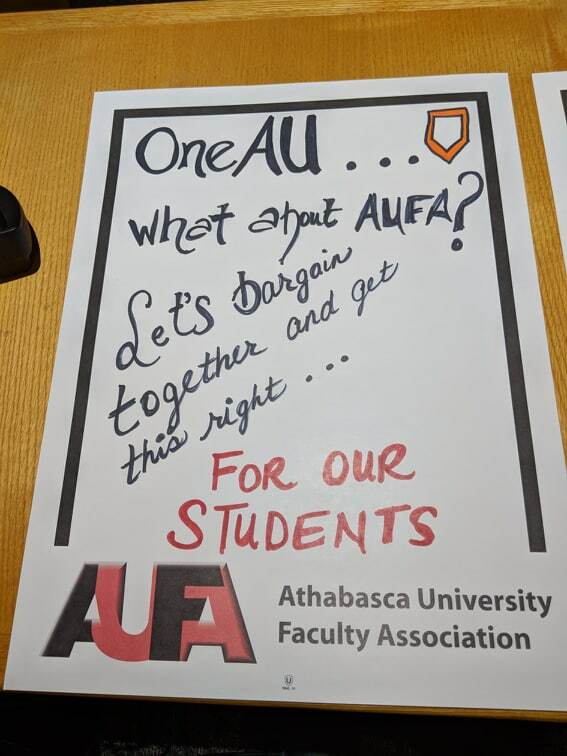 If I were a Board member or the government, I would be asking some hard questions about why AU’s executive would risk the institution’s reputation and finances in order to get unnecessary rollbacks that are profoundly out of step with the provincial settlement pattern. 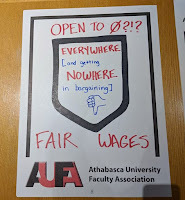 Personally, I can’t imagine why. 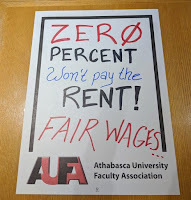 It appears irrational and short-sighted.